Over the coming months, the Bad at Sports blog is featuring quick glimpses of the art world as it exists in smaller cities across the country and around the world. Each glimpse is byway of some of the said city’s local characters, which include but are not limited to artists, curators, creative writers, and critics. In this Dallas Day article, curator Leigh A. Arnold tours the Dallas sites. I moved to Dallas over eight years ago, which by all accounts qualifies me as a true Texan. Though, to be honest, Dallasites are so friendly I am certain that the moment I signed my first apartment lease, I was considered one of their own. Regardless of how Texan I may be, eight years is unquestionably enough time to gain some perspective on the area arts community. What is interesting to report is that unbeknownst to me when I arrived in Dallas in 2006, the city’s art scene was on the cusp of a major upswing in activity. Since my arrival, Dallas has seen the development of several key contributors to our current state of affairs: the establishment of the vital CentralTrak: The UT Dallas Artists Residency, the continued progress of the Dallas Arts District, Dallas Contemporary’s move to the bigger digs in the Design District, the Dallas Art Fair, and most importantly: the development of what I would tentatively describe as an “underground” or at the very least, grassroots art scene at the hands of some of the area’s most talented young artists. Lumped within this “underground” development are a variety of collectives, individuals, galleries, and alternative spaces that have built and sustained a community that is grabbing national headlines. 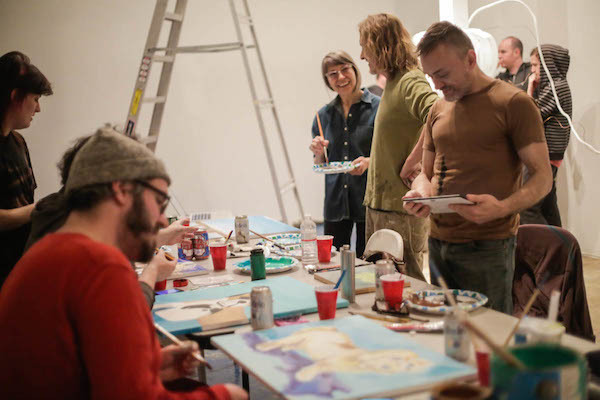 Members of the weekly sketch club, Children of Artemis, meet at CentralTrak to paint their versions of George W. Bush paintings. My awareness of the local arts scene was magnified during my tenure as a researcher and curator for the Dallas Museum of Art’s 50-year art scene retrospective titled DallasSITES. The project sought to accomplish for the Dallas area what the Pacific Standard Time initiative did for Southern California, essentially the recovery of recent art history specific to our local geography. Not only did my research for this project familiarize me with the rich history of contemporary art in Dallas, but it also pushed me to explore what was happening in the now. What became increasingly apparent is that history does indeed repeat itself, if in slight incremental improvements. 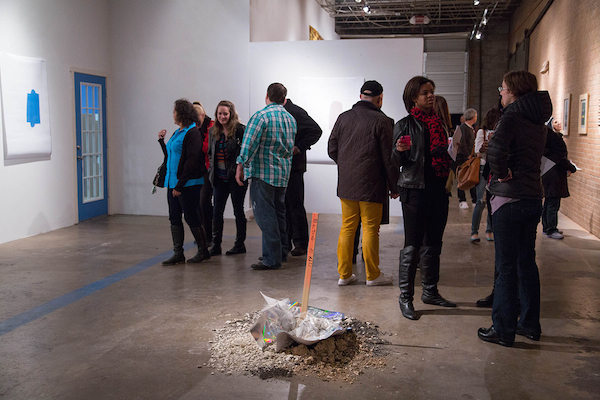 Artists’ concerns are universal and timeless – issues of space and support (financial, creative, emotional) continually plague Dallas artists, as they do nearly everywhere. 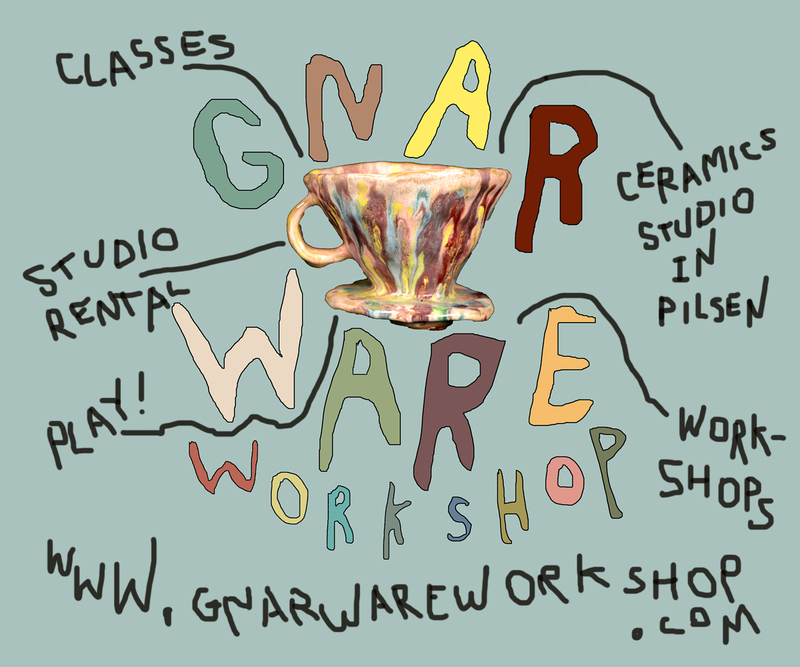 But for every problem presented to Dallas artists, creative solutions abound. Take for example, the issue of space. Fortunately for artists here, the old adage “everything in Texas is bigger” is true and unlike New York City or Los Angeles, big spaces do not necessarily come with outrageously expensive rental rates. Thanks to the support of several real estate developers around Dallas, exciting projects are happening. In the area known as Deep Ellum—historically recognized as the birthplace of early jazz and blues in Dallas—the artist duo Jeff Gibbons and Justin Ginsberg, also known as Apophenia Underground, have been hosting the curatorial project Deep Ellum Windows. Through an agreement with the neighborhood property owner, the duo have extended space to curators and artists who in turn have converted otherwise vacant storefronts into challenging and thought-provoking exhibitions. Past shows have included the work of Dallas-based artists Cassandra Emswiler, Stephen Lapthisophon, and Brandon Kennedy, alongside national and international artists Kristin Oppenheim and Rachel de Joode. 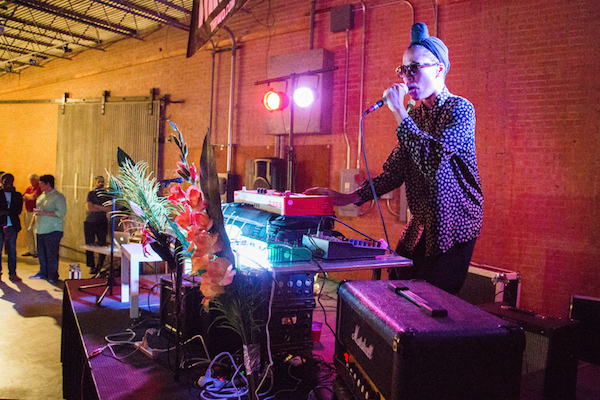 Active for over a year, Deep Ellum Windows represents the kind of possibilities that can happen when enterprising artists connect with open-minded property owners. Another example of this kind of synergy is happening in the neighborhood of West Dallas, a stone’s throw (or five minute drive on the freeway) from Deep Ellum. Previously blighted by lead contamination and a history of neglect from the City of Dallas, this area of town has recently undergone a complete renaissance with the development of neighborhoods like Trinity Groves and Sylvan/Thirty. Restaurants, shops, and new dwelling units are helping to gentrify the neighborhood and artist Arthur Peña’s various warehouse projects are making West Dallas a hot spot for the Dallas art avant-garde. Peña is an Oak Cliff native, who attended the Rhode Island School of Design for his MFA before coming back to his home town. Since his return, he has managed to develop the exhibition/performance venue Ware:Wolf:Haus, as well as the concert space Vice Palace, all while pursuing his own artistic career. On any given weekend night (and an occasional weeknight), Peña’s spaces are pulsing with energy, from the art scene regulars stopping by to check out the latest exhibition to the beats from the latest incarnation of Dallas performance artist George Quartz and his band of misfits and back-up dancers. 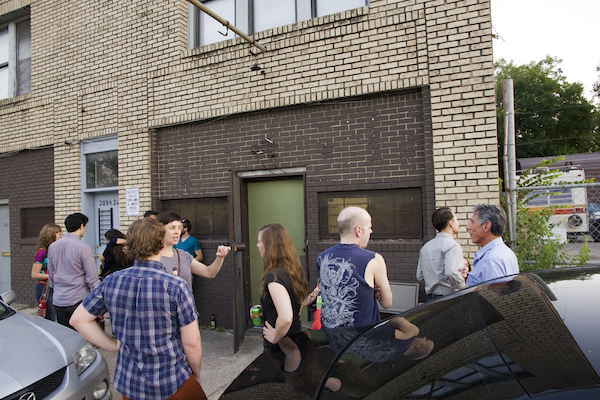 Apart from Deep Ellum Windows and Peña’s West Dallas projects, the city has also seen a revitalization of artist-run spaces and alternative galleries. By now considered Dallas’ standard go-to for challenging work and off-the-wall installations, Oliver Francis Gallery located in East Dallas, started in 2012 as a labor of love for UT-Arlington grad, Kevin Jacobs. With the energy of a school boy, Jacobs curates his modest space with artists from his gallery roster (which includes Peña, Gibbons, Jeff Zilm, and Moreshin Allahyari, among others) and also willingly hands over the keys to artists seeking to explore their own curatorial concerns, most notably, the artists of DB14: Dallas Biennial: Michael Mazurek and Jesse Morgan Barnett. Jacobs’ day job as the Assistant Curator at the Goss-Michael Foundation uniquely positions him to have access to the ever-elusive institutional support. Through his position there, Jacobs is able to cross-pollinate his artists with those in the Goss-Michaels galleries, in effect putting his artists’ work in front of some of Dallas’ most well-known and deep-pocketed collectors. Operating outside the concerns of collectors, i.e., commercialism, Karen Weiner’s wonderfully intimate and cerebral space, The Reading Room, located around the corner from Oliver Francis Gallery and facing Fair Park, provides the kind of quiet, yet powerful programming that fills a void in the Dallas art community. 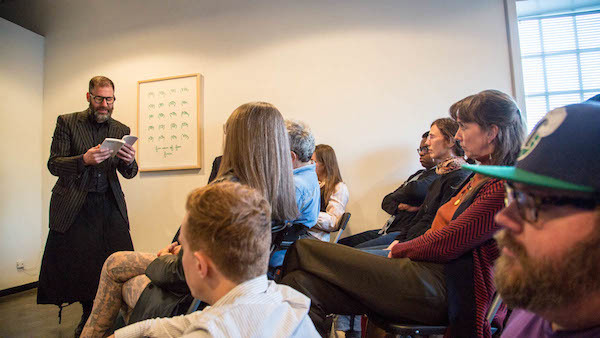 With a focus on the influence of language on the visual arts, Weiner’s single-room gallery has hosted exhibitions by artists like Matthew Cusick, Rebecca Carter, Amy Revier, and The Art Foundation – a curatorial collaboration consisting of Ryder Richards, Lucia Simek, and Andrew Douglas Underwood, alongside programs and performances like a reading by Kenneth Goldsmith, a performance of Robert Ashley’s work by the sibling duo Nicolas and Andrew Miller, and even an exotic mushroom demonstration by local produce purveyor Tom Spicer. 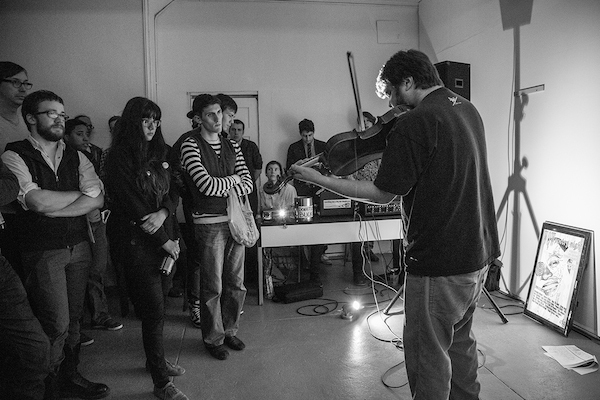 What Weiner’s space and those of Jacobs, Peña’s and the Apophenia Underground duo’s prove is that support need not be top-down for an artistic community to thrive. For all of its accomplishments, the Dallas arts community is still a very self-conscious one, as the recent response to Artforum’s society-page-worthy recap of the Dallas Art Fair will attest. Yes, Dallas boasts a very active and internationally-known collector community, but that community is largely absent from any of the spaces/events mentioned above. This is in part due to the city’s persistent need to feel validation, and in the case of the deep-pocketed collectors, that validation must come from the outside, before it will garner any kind of support from them. Until those collectors feel secure enough in their own ability to make decisions about what to acquire/support, this divide between the collector class and the artist class will persist. Fortunately for Dallas, the artists here do not seem too concerned with bridging that gap. They are too busy making exciting things happen. Leigh A. Arnold is a curatorial fellow at the Nasher Sculpture Center and consulting curator for the exhibition Robert Smithson in Texas at the Dallas Museum of Art, on view through April 2014. 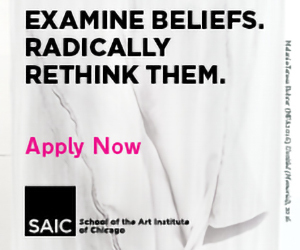 She has previously held the position of research fellow at the Dallas Museum of Art for the special project DallasSITES: Charting Contemporary Art, 1963 to Present, which culminated in an exhibition and online publication in the spring of 2013. In addition to her professional endeavors, Arnold is a doctoral candidate at the University of Texas at Dallas, where she is writing on Robert Smithson’s relationship to Texas.